Tag is a 2018 American comedy film directed by Jeff Tomsic (in his directorial debut) and written by Rob McKittrick and Mark Steilen. The film is based on a true story that was published in The Wall Street Journal about a group of grown men, played by Ed Helms, Jake Johnson, Hannibal Buress, Jon Hamm, and Jeremy Renner, who spend one month a year playing the game of tag. Annabelle Wallis, Isla Fisher, Rashida Jones, and Leslie Bibb also star. It was released on June 15, 2018, by Warner Bros. Pictures, received mixed reviews from critics and has grossed over $78 million worldwide. Hogan "Hoagie" Malloy, Bob Callahan, Randy "Chilli" Cilliano, Kevin Sable and Jerry Pierce have been playing tag since they were nine years old, starting in 1983, during the month of May. Since then, the group’s main rule of the game is that the last one tagged is “it,” until next season. With Hoagie having been the last one tagged in the previous year, he first recruits Bob, the CEO of an insurance company, and then Chilli and Kevin for one last attempt to tag Jerry, who has seemingly never been tagged because of his strong athleticism and intelligence. Hoagie tells them that Jerry plans to retire after this year's game because of his upcoming marriage. Rebecca Crosby, a Wall Street Journal reporter doing a piece on Bob, joins them and decides to write an article on the friends. They are also accompanied by Hoagie's wife Anna. Once they arrive at their hometown of Spokane, Washington, they locate Jerry at the local country club where he will be getting married, but they are overwhelmed by Jerry's skill. Jerry then introduces his fiancee Susan. As the others express disappointment over not being invited to the wedding despite their close relationship, Jerry knew he would almost certainly be tagged or at least targeted during the ceremonies. They agree to not play the game at any wedding-related events in exchange for invitations to the wedding. Despite this, the group makes several attempts to tag Jerry both before and right after wedding-related events. The group sneaks into his house at night, but are forced to leave when Jerry sets up a convincing ruse that he is in Hoagie’s bedroom. The next morning, Hoagie disguises himself as an elderly woman and ambushes Jerry at the mall, but is defeated. Then, at a rehearsal dinner at the country club, Jerry invites Cheryl Deakins, Bob and Chilli’s high school crush, to distract the group, and the attempt to tag Jerry results in a golf car chase that eventually leaves Hoagie, Chilli, and Kevin all caught in painful traps in the woods, set by Jerry. During the rehearsal dinner, Susan reveals to the guys that she is pregnant. Defeated, the group try to build a new plan. After finding out Jerry attends Alcoholics Anonymous meetings, the group decide to strike his next meeting, which is on his wedding day. In preparation, they lock every exit and dress up as members of AA. They make their move and almost tag Jerry, but once he finds himself trapped, Jerry retreats to the communion wine storage. He stays there for hours as the guys besiege the room, until Susan comes by, with the wedding just a few hours away. Susan berates Jerry and the others for risking the wedding for a childish game but suddenly appears to fall faint and have a miscarriage. Jerry comes out to help. Chilli is convinced that it is a ruse, but the situation seems authentic, and Jerry himself also tells them he is not playing around and the two leave. The guys receive texts that the wedding is postponed due to the potential miscarriage. However, a suspicious Anna sees that the bridesmaids all made similar Instagram posts. With one of the bridesmaids having a crush on Bob, and also having a private profile, Anna creates a fake profile for Bob in order to bait the bridesmaid for the truth. Once they get access, they see a post from the bridesmaid of Susan in her dress, showing that the wedding is still on schedule. Incensed by the trick, the gang decide to crash the wedding. Upon their arrival, Susan confirms the hoax, including the pregnancy being fake. Angry at Jerry for lying, Hoagie decides to tag Jerry at the end of the ceremony after the doves are released. Hoagie charges at Jerry, but narrowly misses and ends up tackling the pastor to the ground. Hoagie then loses consciousness, which Jerry thinks is a ruse, but Anna confirms that Hoagie's condition is serious and calls for an ambulance. Everyone meets up at the hospital where Hoagie tells them he has liver cancer. Knowing he may not be alive for the next season, Hoagie lied about Jerry quitting because he wanted to reunite everyone for one last attempt to tag him. At his friends and wife’s urging, Jerry finally swallows his pride and allows Hoagie to tag him. With only five minutes left the group continues the game, running around the hospital as they did as children, and briefly change their rules so Anna, Rebecca, and Susan can play as well. Before the credits roll, multiple photographs and video clips are displayed, showing the real group of ten men that inspired the film, who continue to play to this day. The film is based on a real-life group of friends from Spokane, Washington, known for playing a month-long game of tag every February over a 28-year period, governed by a contract written by Patrick J. Schultheis. The group was profiled in The Wall Street Journal in January 2013, after which they began receiving offers to adapt their story into a film. They sold the rights to their story the next month. It was initially developed with Will Ferrell and Jack Black in mind; however, both eventually left the project. By March 2016, Ferrell and Black were no longer attached to the project, Jeff Tomsic was set to direct the film and Ed Helms and Tracy Morgan were cast. In April 2017, Jeremy Renner and Hannibal Buress joined the cast. In May, Jake Johnson and Annabelle Wallis were cast. Jon Hamm, Isla Fisher and Rashida Jones were cast in June, with filming due to begin in Atlanta, Georgia later in the month, specifically on June 23, with casting for extras issued. Leslie Bibb was added to the cast as filming began on June 20. Principal photography began in June 2017 in Atlanta, Georgia. In July 2017, Jeremy Renner fractured his right elbow and left wrist after falling 20 feet while performing a stunt. He ended up performing the stunt a second time before going to the hospital, and the production team used CGI to remove his casts in post-production. Tag grossed $54.7 million in the United States and Canada, and $23.4 million in other territories, for a total worldwide gross of $78.1 million, plus $6.3 million with home video sales, against a production budget of $28 million. In the United States and Canada, Tag was released on June 15, 2018 alongside Incredibles 2, and was projected to gross $12–16 million from 3,382 theaters in its opening weekend. The film made $1.3 million from Thursday night previews, similar to the $1 million made by fellow R-rated comedy Game Night the previous February, and $5.4 million on its first day. It went on to open to $14.9 million, finishing third at the box office, a figure Deadline Hollywood said "isn't bad, isn't good, it's OK" considering its $28 million production cost. It dropped 45% to $8.5 million in its second weekend, finishing fourth, and $5.6 million in its third weekend, finishing sixth. On review aggregator Rotten Tomatoes, the film holds an approval rating of 56% based on 186 reviews, and an average rating of 5.42/10. The website's critical consensus reads, "For audiences seeking a dose of high-concept yet undemanding action comedy, Tag might be close enough to it." On Metacritic, the film has a weighted average score of 56 out of 100, based on 35 critics, indicating "mixed or average reviews". Audiences polled by CinemaScore gave the film an average grade of "B+" on an A+ to F scale, while PostTrak reported filmgoers gave it a 78% overall positive score. 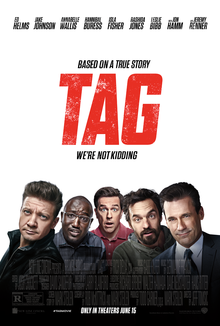 Tag was released on digital copy on August 17, 2018, and on DVD and Blu-ray on August 28, 2018. ^ a b c d "Tag (2018)". Box Office Mojo. Amazon. Retrieved January 4, 2019. ^ Medeiros, Madison (March 20, 2018). "The Unbelievable True Story Of A 23-Year-Old Game Of Tag Is Now A Movie". Refinery29. Retrieved March 20, 2018. ^ Adams, Russell (January 28, 2013). "It Takes Planning, Caution to Avoid Being 'It'". The Wall Street Journal. Dow Jones & Company. Archived from the original on December 31, 2014. Retrieved May 24, 2018. ^ Scott, A.O (June 14, 2018). "Review: 'Tag,' You're It. Playing the Long Game Into Middle Age". The New York Times. Retrieved August 12, 2018. ^ Lamberson, Carolyn (March 20, 2018). "'Tag' you're it: Spokane-born, decades-long game of tag coming to the big screen". Spokesman-Review. Retrieved June 10, 2018. ^ "TAG Participation Agreement" (PDF). University of Chicago Law School. Retrieved July 30, 2018. ^ a b Lussier, Germain (February 14, 2013). "Real Life 23-Year-Long Game of Tag To Be Turned into a Movie". /Film. Retrieved March 23, 2018. ^ Clark, Doug (May 26, 2013). "Clark: The game of tag that never ends". Spokesman-Review. Retrieved June 10, 2018. ^ Fleming, Mike Jr. (May 13, 2013). "Medieval Times Headed For Movie Screen". Deadline Hollywood. Penske Business Media. Retrieved August 12, 2017. ^ Fleming Jr., Mike (October 25, 2016). "Ed Helms & Tracy Morgan Up For Game Of 'TAG' At New Line". Deadline. Retrieved August 12, 2017. ^ Kroll, Justin (April 5, 2017). "Jeremy Renner and Hannibal Buress Join Ed Helms in New Line's 'Tag' (EXCLUSIVE)". Variety. Retrieved August 12, 2017. ^ Kroll, Justin (May 10, 2017). "'New Girl' Star Jake Johnson Joins Ed Helms, Jeremy Renner Comedy 'Tag' (EXCLUSIVE)". Variety. Retrieved August 12, 2017. ^ Tartaglione, Nancy (May 23, 2017). "Annabelle Wallis Tapped For 'Tag'; Jeremy Renner, Ed Helms Comedy From New Line". Deadline. Retrieved August 12, 2017. ^ "Jon Hamm Joins Ed Helms, Jeremy Renner in New Line Comedy 'Tag' (Exclusive)". The Hollywood Reporter. Retrieved August 12, 2017. ^ "Isla Fisher Joins Ed Helms, Jeremy Renner in New Line Comedy 'Tag' (Exclusive)". The Hollywood Reporter. Retrieved August 12, 2017. ^ "Tracy Morgan's 'TAG' Atlanta Casting Call for a Country Club Scene". Project Casting. June 13, 2017. Retrieved August 12, 2017. ^ Hipes, Patrick (June 20, 2017). "Leslie Bibb Game For New Line Comedy 'Tag'". Deadline. Retrieved August 12, 2017. ^ McNary, Dave (June 13, 2017). "Isla Fisher Joins Ed Helms, Jeremy Renner in Comedy 'Tag'". Variety. Penske Business Media. Retrieved June 16, 2018. ^ Barraclough, Leo (July 7, 2017). "Jeremy Renner Fractured Both Arms During Stunt Gone Wrong". Variety. Retrieved October 4, 2017. ^ Sharf, Zach (June 6, 2018). "Jeremy Renner Finally Reveals How He Broke Both Arms During 'Tag' Filming: 'I Couldn't Rotate My Hands'". IndieWire. Penske Business Media. Retrieved June 16, 2018. ^ "Tag (2018)". The Numbers. Nash Information Services, LLC. Retrieved December 19, 2018. ^ D'Alessandro, Anthony (June 12, 2018). "'Incredibles 2' Poised To Squash 'Dory's $135M All-Time Opening Record For Animated Pic". Deadline Hollywood. Retrieved June 12, 2018. ^ a b D'Alessandro, Anthony (June 17, 2018). "'Incredibles 2' Even Stronger As Pixar Pic Soars To Amazing $181M – Early Sunday Update". Deadline Hollywood. Retrieved June 17, 2018. ^ D'Alessandro, Anthony (June 24, 2018). "'Jurassic World: Fallen Kingdom' With $150M Reps Uni's 2nd Highest Opening Ever – Sunday". Deadline Hollywood. Retrieved June 24, 2018. ^ D'Alessandro, Anthony (July 1, 2018). "At $2.5B To Date, Summer's B.O. Is More Colossal Than Ever Imagined; Dinos Still Rule With $60M+ Second Weekend". Deadline Hollywood. Retrieved July 1, 2018. ^ "Tag (2018)". Rotten Tomatoes. Fandango Media. Retrieved January 4, 2019. ^ "Tag Reviews". Metacritic. CBS Interactive. Retrieved July 7, 2018. This page was last edited on 9 April 2019, at 06:41 (UTC).